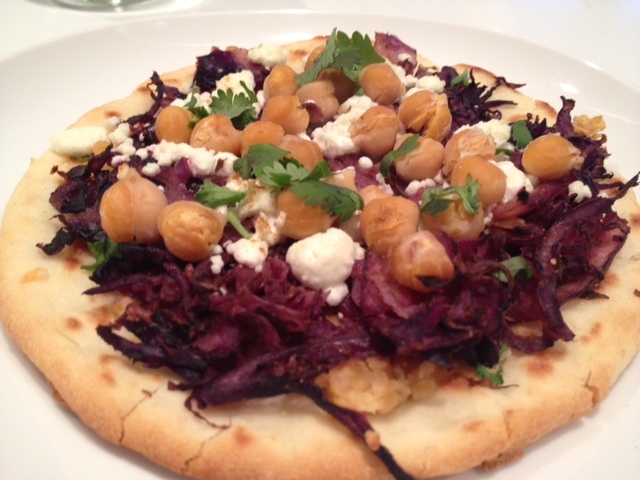 chickpea pizza | shirley does Feminism. It’s day 5 of the diet and I must say… things are good! I have had only one stomach ache (opposed to 5) which is a big relief! Pittas are supposed to eat cooling foods. Garbanzo (chickpeas) are one of the foods that are okay to eat. Last week we made these pizzas and they were great. I am glad it aligns to the ayurvedic diet and we can make it again! 1. Over medium heat heat 1/2 tbsp of the olive oil in a non stick pan. Place cabbage in pan with balsamic. Mix ingredients, lower temperature a little, cover and let cook for 10 minutes. 2. In a food processor place half of chickpeas, 1 tsp cumin, 2 tbsp of cilantro and mix. 3. Remove cabbage and drizzle with honey, set aside. 4. Clean out the skillet, lightly dust pitas with olive oil and toast each side. 5. On a greased cookie sheet place pitas and spread chickpea mix evenly on pita. Distribute cabbage evenly among each pita. Then top with remaining chickpeas, sprinkle with cumin and goat cheese. 6. Place in the oven for approximately 6 minutes, or until cheese begins to soften and melt.